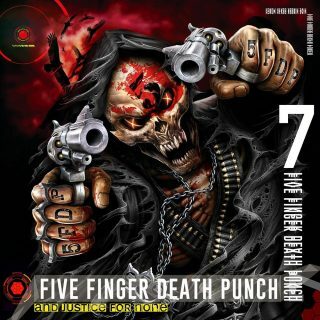 Five Finger Death Punch : And Justice For None album download | Has it Leaked? Las Vegas natives, Alternative Metal band, Five Finger Death Punch have just revealed the titled, release month and album covers for their upcoming seventh studio album. This record will follow up their "Got Your Six" from 2015, and their more recent greatest hits album "A Decade of Destruction" from late last year. The new album is titled "And Just for None" which is set to release in May of this year through their new label, Rise Records. Used to like these guys. This leak has been confirmed false. The original poster on Kingdom Leaks says that he made this up. Am I even allowed to link to where he said he made it up? Or do I need to screencap and post to Imgur? Seems wierd they’re DMCA takedown-ing any site that posts about it then. FFDP management DMCA’d the tweet we made, posting the album cover art. It took a while, but we countered with our own claim and won. So now we’re allowed to post the album cover. They really do not like us. The only management ever to send me a DMCA about something like this was Justin Timberlake’s management – Back in 2013. It’s wierd they’re being so controlling about it. When they were the ones dumb enough to accidently upload it to their store for pre-order a couple weeks ago which caused this whole leak. How the heck has this not leaked yet!!!!!?????? where did you hear the snippets? I can’t wait! I hope this leaks before tomorrow morning so I can rock out at work. Albums don’t leak as early as they used to. Looks like my comment that didn’t say anything wing got deleted…. I’ll have to give this a listen, given how high the ratings are.